There is something about those brightly coloured laundry tablets that is irresistible to young children. And every time I hear about another accident I wondered what intelligent person thought this was a good idea. Simone Jones turned her back for a second when her one year old daughter managed to reach inside a child-locked cupboard and pull a laundry tablet through the gap. The liquid burst and spread over her eyes and face. The little girl had 95 per cent burn to the cornea in her left eye after the protective layer was stripped off and five per cent burns to the right eye. They won’t know about long term vision damage until the child’s pupil responds to light properly and her eye lid is no longer closing. Her mother shared this on Face book to warn other mothers. This is something that comes up many times on our first aid training courses. Interestingly because Safe and Sound’s instructors are mostly paramedics who work extensively in accident and emergency medicine, sadly it something which they have had to deal with many many times. 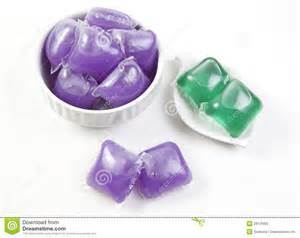 A survey by the National Poisons Information Service reported that at least one child a day eats a laundry gel capsule because they look like sweets and that there were more than 2000 recorded cases in five years usually involving a child under 5. The capsules contain a cocktail of harmful chemicals and because of their bright colours children mistakeningly think they are sweets. “The frequency with which these incidents are occurring — at least one a day – is very worrying,” said Izzi Seccombe of the Local Government Association, adding that the incidents are preventable. Which is all very well but even the most diligent of parents have that one unguarded moment and we see from the mother of the 1 year old that some of the child proofing that we rely on is not that always that safe. While child resistant tops and blister packs help to slow children down some 3-4 year olds can open them in seconds. Apparently though it is the everyday medicines that we might keep in a hand bag or bedside cabinet that are the most common way for children to be poisoned. Keeping your medicines and cleaning things locked both out of reach and sight is the safest way to protect children. Ideally in a high lockable cupboard and in a room which is used a lot. That way if your child has climbed up on a chair or worktop and is exploring in cupboards they are more likely to be seen by an adult or brother or sister. Of course there are always exceptions as I found out many years ago when my toddler swallowed nearly half a bottle of Calpol which was high on a shelf and yet he managed to clamber on to a chest of drawers and then reach up to the shelf. The pink liquid looked inviting and moreover it tasted good. It involved an A & E visit, a reprimand and a visitor from a social worker the next day. But he is was ok. Toddlers like to copy what adults do so it is a good idea to take your medicine when your toddler isn’t around, and avoid pretending your child’s medicine is a sweet, even if it’s hard to get them to take it. It can be confusing for them. If they have swallowed the substance get them to rinse out their mouth and give them frequent sips of water or milk. If the child becomes unconscious – open the airway and check for breathing. If they are breathing put them in the recovery position. If they are not breathing start CPR using a protective shield. NEVER MAKE THE CHILD VOMIT. THIS MAY PUT THE THE AIRWAY IN DANGER.